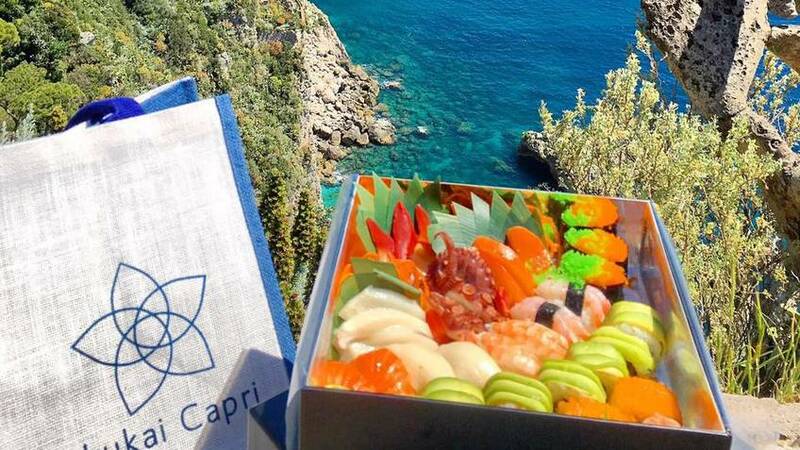 There's just one spot on Capri where you can savor Japanese dishes...or any ethnic cuisine for that matter! Stop in the cozy and elegant Kukai Capri, the sister restaurant of Kukai Nibu, which has been serving Japanese classics in Naples for years before opening their second location on Capri. To find Kukai Capri, you'll have to stroll through the picturesque lanes of the historic center of Capri town just off the Piazzetta. You'll recognize the restaurant on Via Listieri by the two plate glass windows holding the traditional plastic models of the menu selections. Once inside, the custom decor will soothe you with its clean glass and metal decor offset by a blue palette to represent the colors of Capri. The menu includes all the classics of any international "sushi bar", prepared primarily with locally caught fish and only the gourmet "Koshinikari" strain of rice, grown and harvested in California and considered ideal for sushi. Your sushi order can be made according to your own preferences, or you can let the experienced chef put together a set based on the catch of the day. All orders are packaged in elegant lacquer boxes, and for take-away and delivery for an unforgettable meal at sea or al fresco, a cooler is provided to guarantee the quality and safety of your sushi. A light and fresh sushi meal from Kukai is perfect for a picnic at sea, paired with one of Kukai's personalized wines. We can deliver to any yacht or villa in Capri town, or elsewhere on the island.